Antique Bloom Quilt Set features floral and paisley patterns in brilliant and bold colors, printed in a "patchwork" effect. 100% cotton. By Olivia's Heartland. Set a antique chic style scene in your bedroom with this pretty quilt! 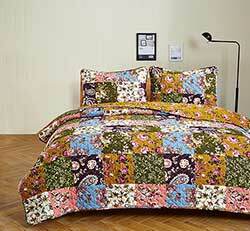 Features printed squares in paisley and floral patterns, with attractive diamond quilting.